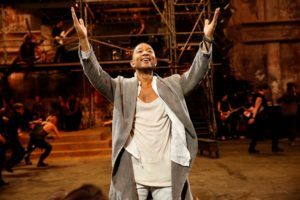 With the R&B hitmaker John Legend playing Jesus Christ, Sara Bareilles as Mary Magdalene and Brandon Victor Dixon as Judas Iscariot, NBC’s “Superstar” didn’t lack for talent or star power, drawn as it was from the worlds of pop and theater. The real masterstroke, though, was the decision to perform live before a large audience at the Marcy Avenue Armory in Brooklyn. The energy of the crowd clearly goosed the cast, counteracting the over-prepared stodginess that hampers so many of these specials. And the crowd’s passionate whooping underscored one of the musical’s central themes: the dangers of uncritical celebrity worship. Written by Andrew Lloyd Webber and Tim Rice, “Jesus Christ Superstar” has long held something of a surprise place in the modern theatrical canon. Debuting in 1970 as a rock opera album, it made the leap to Broadway in 1971 and was nominated for five Tonys — winning none. The 1973 movie adaptation by the director Norman Jewison was a box-office hit, but it is rarely touted as one of its era’s great films. Told largely from Judas’s point-of-view, the story closely follows biblical accounts of Christ’s arrest and crucifixion in Jerusalem, while adding substantial criticism of Jesus’s followers; his communion with disreputable people; and his open, dangerous antagonism of both the Jewish and the Roman authorities. The musical then pushes back against its own skepticism, depicting the powers-that-be as corrupt, cynical and manipulative, exploiting the anxieties of Judas and the other apostles. In the years immediately after its premiere, the musical raised eyebrows and ire with its decidedly nontraditional spin on Christ’s last days. By considering Jesus more as a cultural phenomenon than as a divine figure, and by exhibiting as much sympathy for Judas as for the man he betrayed, Mr. Webber and Mr. Rice delivered an interpretation of the Passion Play as radical in its way as director Martin Scorsese’s much-protested film “The Last Temptation of Christ” did in 1988. NBC’s version showed reverence primarily toward the original musical, which for decades has told an ancient story in a way that pushes the audience to reconsider its relevance to the world today. Directed by David Leveaux and Alex Rudzinski, it respected the source material’s sublime ambiguities, which many nonreligious fans have interpreted as subversive — just as some pop-culture-savvy Christians have clung to it as a refreshingly tuneful, exultant expression of how faith can triumph over doubt. The powerful and charismatic Mr. Dixon more than compensated for any of the headliner’s shortcomings. Given what “Jesus Christ Superstar” ultimately says about idols and the people in their shadow, it is appropriate that this production was dominated by a Broadway veteran best known for replacing Leslie Odom Jr. as Aaron Burr in the Tony-winning smash “Hamilton.” This show has always been less about the titular “superstar” than about the people surrounding him. This theme was evident in the telecast’s staging. In the early going, audience noise sometime overloaded the sound mix, making it hard to hear the lyrics. But by urging the crowd to go bananas every time Mr. Legend sung or even moved, the creative team reinforced the idea that perhaps the masses gathered around Jesus weren’t paying close attention to his actual message. The set design and costuming were effectively minimalist, with a vaguely post-apocalyptic “Mad Max: Beyond Thunderdome” feel. Exposed scaffolding, freshly painted graffiti and a teeming horde of shabby-looking extras added to the overall vibe of controlled chaos. That mayhem occasionally gave way to moments of startling clarity, including: Alice Cooper’s magnificently scenery-chewing performance of “King Herod’s Song”; Mr. Dixon’s rousing take on the show’s big anthem, “Superstar”; and a miraculous bit of stagecraft during the crucifixion, in which Mr. Legend’s Jesus seemed to disappear into another dimension. Give a lot of credit to the network, and to Mr. Legend, who was one of this broadcast’s executive producers (along with Mr. Weber, Mr. Rice, the televised theater veterans Craig Zadan and Neil Meron and others). A live musical about Jesus on Easter Sunday may seem like a safe choice, catering to an audience that has made Christian-themed movies like “I Can Only Imagine” into hits. But from the multicultural cast to its deconstruction of religious iconography, this “Jesus Christ Superstar” was as thoughtful and challenging as the show has ever been. Aired Sunday on NBC; available on NBC.com.